20cm x 20cm filter pads made for 20x20 plate filters. 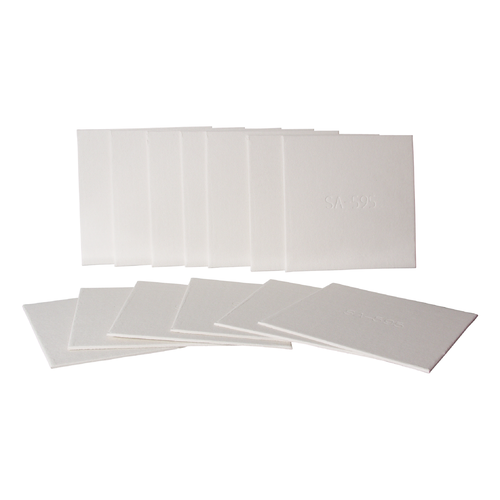 1.5 micron pads are for fine polishing of the wine, or for preparing wines to go through a sterile cartridge filter. Please note that all pad filters are rated 'nominal', meaning that about 90-95% of all particulate matter at the micron rating will be filtered out. There will always be a little bit of smaller material that is also filtered out, as well as some larger material that will make it through. We use these, and many other ratings of these filter sheets in our small winery. The Seitz brand is nice in that each sheet is stamped with the micron rating. Other brands we have used, while less expensive, are not identified except on the box so packages of 25 can be tricky to keep track of.